There are lots of reasons for sharing one’s device Screen to another. If you working in a Group or you got stuck somewhere with your Android Device and you need help remotely etc., in this situation like another person can easily access your device remotely and sort out the problem. So, How we can remotely control an Android Device with Another Device? There are lots of Apps available on Google Play Store, for Remote Control of Andriod Device. These apps also provide your extra features so that you can easily control or access another Android Device remotely. Here we will explain one of the popular and worldwide used app: ‘TeamViewer’. ‘Teamviewer’ is Free App available on Google Play Store. TeamViewer gives you fast, easy and secure remote access to another android device. As this tool is available for all other OS like Windows, Mac, etc, it makes you easy to control any device remotely with this single tool. Step 1. 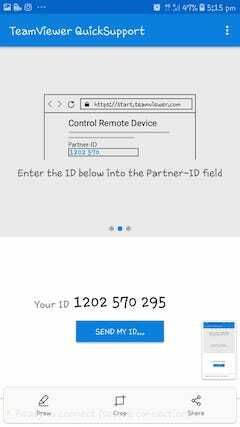 First, download & Install “Team Viewer for remote control” App from Google play store on Visit Here. Step 2. 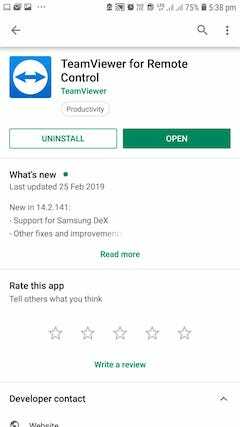 Then Install “Team Viewer Quick Support” App from google Play Store. Step 3. 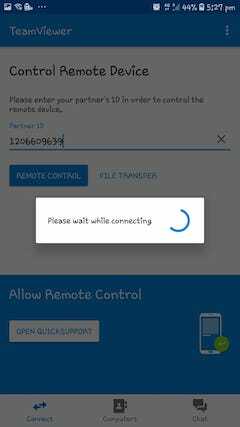 Now you have to open the “Team Viewer Quick Support” on your Android device and open the “Team Viewer Remote Control” on your partner android device. Step 5. After that you have to allow your device for remote support, click on the “Allow” option for access one android phone from another. In this way, anyone can remotely control another Android device from their device. We can also remotely control any PC or Computer using this tool. Just have to install TeamViewer application on the system also.